This is an interesting feature, but I think it’s going to confuse and anger a lot of people. 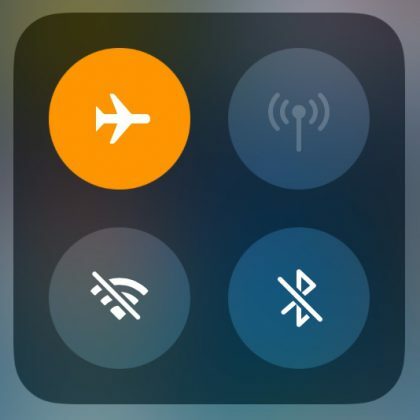 Until iOS 11, the Wi-Fi and Bluetooth toggles in Control Center worked the way it looked like they worked: they were on/off switches. Now, in iOS 11, they still look like on/off switches, but they act as disconnect switches. Off the top of my head, I would suggest making them three-way switches: on and connected, on but disconnected, and off. Completely agree. This setup is confusing. As John points out, when you tap the WiFi button, WiFi is left on, but you are disconnected from your current session. Tap it again, you are reconnected. The icon goes from a blue background to a grey background, and back to blue when you reconnect. The grey background with the line through it shows that Bluetooth and WiFi are now disconnected. In Airplane mode, a tap on the WiFi icon goes from disabled to connected (assuming there’s WiFi to be had), from grey with a line through it to the blue background. Confusing. But once you get the sense of it, it’s pretty clear what’s happening.